Nancy Marie Shehan, 78, of Canyon passed away on Tuesday, December 4, 2018. Vigil will be held at 6:30 P.M. on Thursday, December 6, 2018 at St. Ann’s Catholic Church. Mass will be held at 11:00 A.M. on Friday, December 7, 2018 at St. Ann’s Catholic Church with Rev. Robert A. Busch, Ph.D., officiating. Burial will follow at Dreamland Cemetery. Arrangements are by Brooks Funeral Directors. Nancy was born November 14, 1940 in Yukon, Oklahoma to William and Mae Ast Kelly. 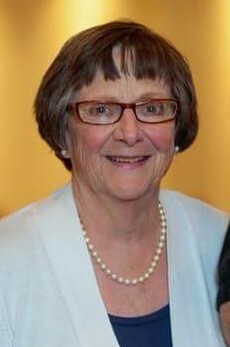 She was the Valedictorian of the Yukon High School Class of 1958. On August 8, 1959, she married Patrick Shehan in Yukon. Nancy was the office manager at Taylor & Son’s for several years and then was a bookkeeper for Brown, Graham & Co.
She was a member of St. Ann’s Catholic Church, St. Martha’s Circle, Legion of Mary, and the St. Ann’s Finance Council. She was an avid golfer and enjoyed being apart of the Palo Duro Creek Women’s Golf Association. Nancy was a devoted prayer warrior. She was also a loving wife, mother, sister, grandmother, and great grandmother. She was preceded in death by her parents, two sisters, Jean Mann and Jane Horne, and a grandson, Charles Johnston. Survivors include her husband of 59 years, Patrick Shehan of Canyon; four children, Gregory Shehan and wife, Maria of Lubbock, Joseph Shehan and wife, Pam of Canyon, Michael Shehan and wife, Cindy of Oklahoma City, and Angela Lawson and husband, Cliff of Canyon; 14 grandchildren, Samantha Tobias and husband, Mark, Beverly Gates and husband, Billy, Lindsey Persyn and husband, Kyle, Kelly Shehan, Jacob Shehan and wife, Kelcey, Aaron Shehan, Mallory Shehan, Christopher Ellison, Amanda Gilbert and husband, Kelby, Stacie Shehan, Jonathan Lawson and wife, Amanda, Rebeca Haynes and husband, John, Joshua Lawson and fiancé, Izzy Wheeler, and Jeremy Lawson; 11 great grandchildren; a sister, Delores Thomas of Edmond, OK; and many nieces and nephews. The family suggests memorials be made to the St. Francis Ministry, P.O. Box 150, Canyon, TX 79015.